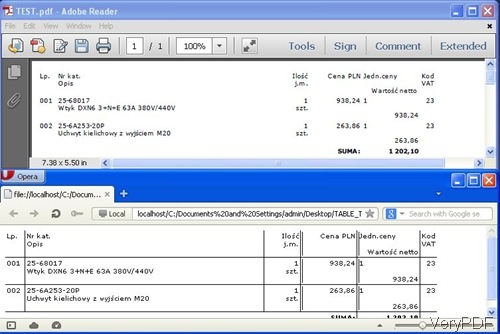 Converting table on HTML to PDF by VeryPDF HTML Converter can be done accurately and fast. This software takes CSS webkit advanced technology, so it can convert table on HTML to PDF file exactly like what it shows in website. In this article, VeryPDF will show you how to make it. What is tables on HTML? When we say tables on HTML, you may be confused what is that. Actually we can see this kind of HTML here and there but we may call it differently. It refers to HTML file with tables. In order to make this definition clear, please check the following snapshot. This kind of html file can be used to list products or price list. In a word, table on HTML means that draw tables on the HTML file. In the market, we can find a lost of software which can be used to convert HTML to PDF but most of them fail to convert those tables on HTML to PDF. If you have tried, you will find that after conversion, the data can be kept on the output PDF file but the tables will disappear. So the conversion fails you more or less. Please check the following snapshot then you can feel what do I mean. It is not hard to find that in the output PDF file there is no table which is good kept in HTML file. How to convert table on HTML to PDF successfully? Download HTML Converter to your computer. As this software is the command line version, after downloading, please unzip it and check the elements in it. If you are not familiar with the command line, please use the GUI version. First you’d better reader the readme.txt to know parameters of this software. Then run the conversion following the example in the templates. As we need to convert tables on HTML to PDF, in the following part, we will only give some command line examples related to this conversion. Parameter -webkit can not be ignored or else the conversion will fail. Now let us the conversion effect when adding parameter -webkit by software VeryPDF HTML Converter 3.0. 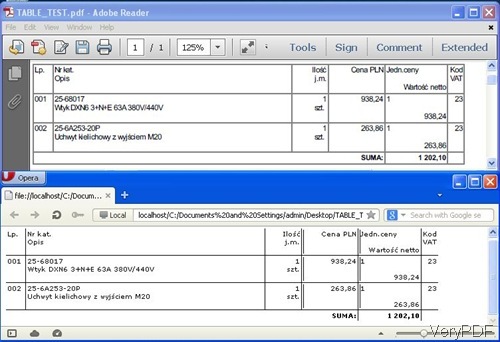 All the tables, font style are kept perfectly in the output PDF file. How to merge PDF by HTML Converter Command Line?